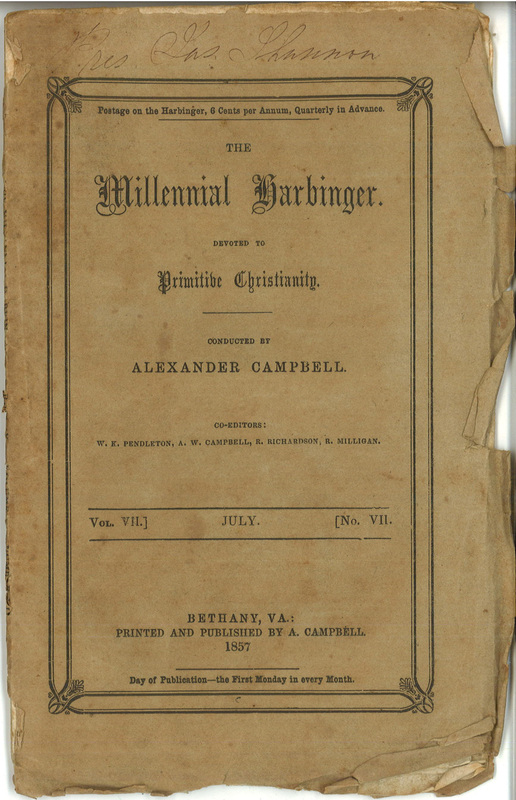 In late summer we acquired a half-dozen single issues of Millennial Harbinger owned by and addressed to James Shannon. 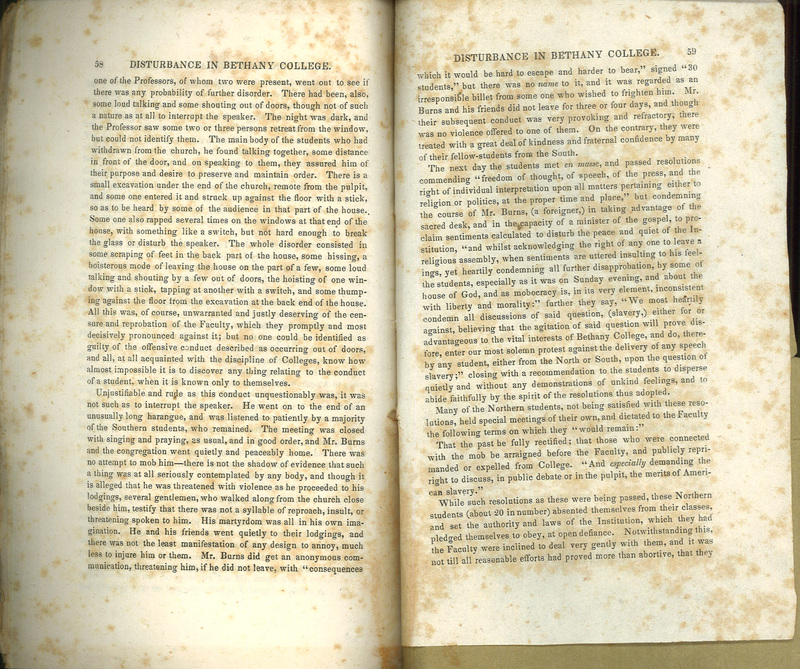 Three issues are from 1849, one from 1856, and two from 1857 and are in fine condition. In 1849 Shannon was President of Bacon College in Harrodsburg, Kentucky and from 1856-1859 he was President at Christian University in Canton, Missouri. 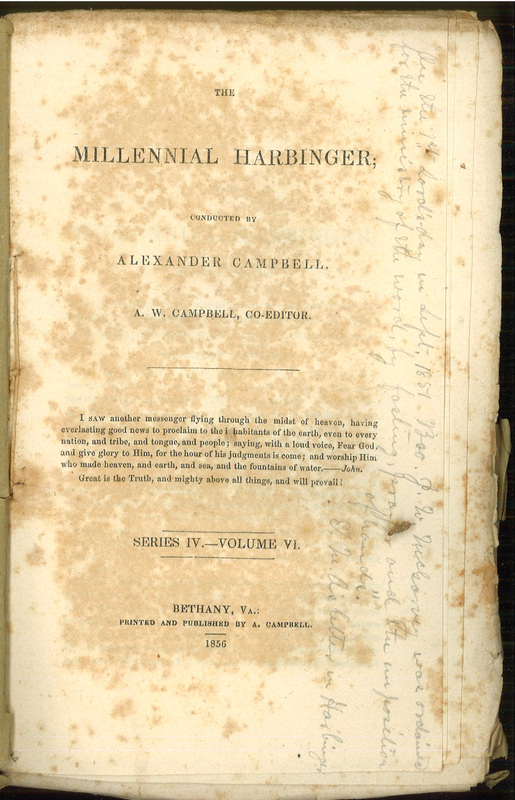 Throughout these years he was an ardent defender of slavery and a frequent contributor to church papers such as Alexander Campbell’s Harbinger. Each issue bears Shannon’s name at the top of the front cover. 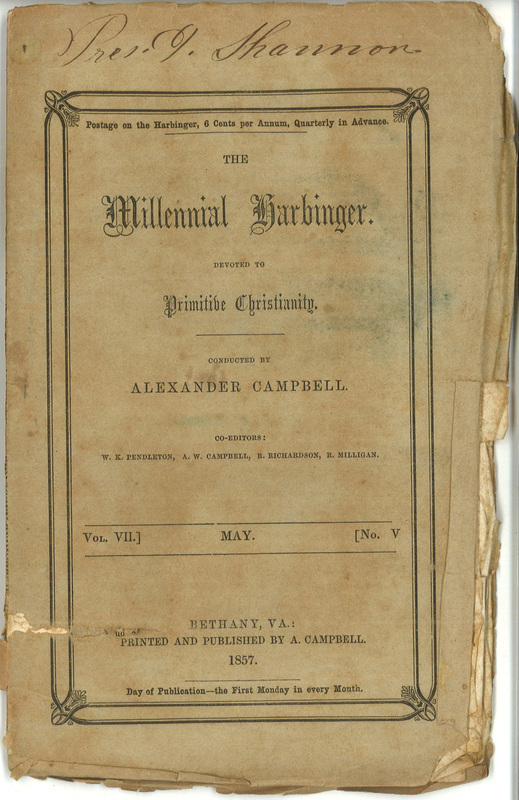 It is unlikely that Alexander Campbell was involved personally in the hand-addressing of each issue of the Harbinger. 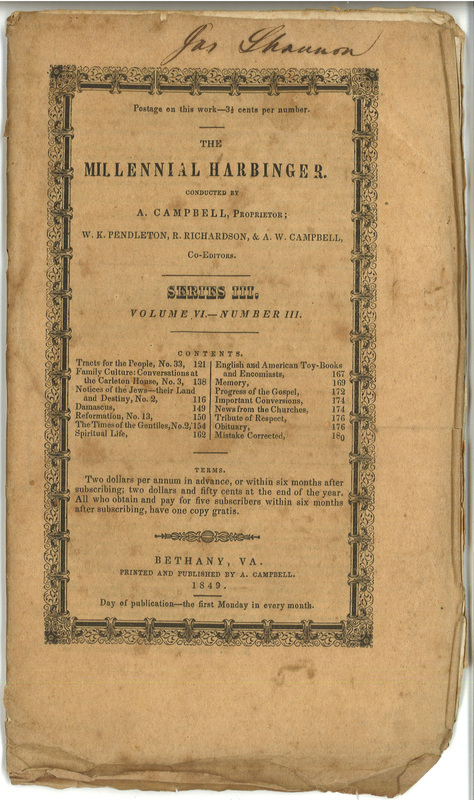 A print shop employee probably penned the names, then bundled issues for each post office, and sent them on their way. At their destination the postmaster split the bundle and distributed them accordingly. 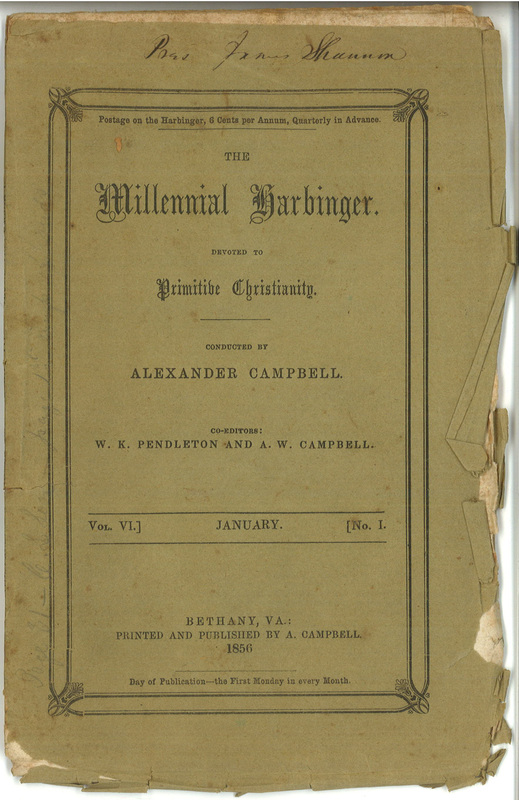 At year’s end subscribers often had their issues bound to make preservation and reference easier. 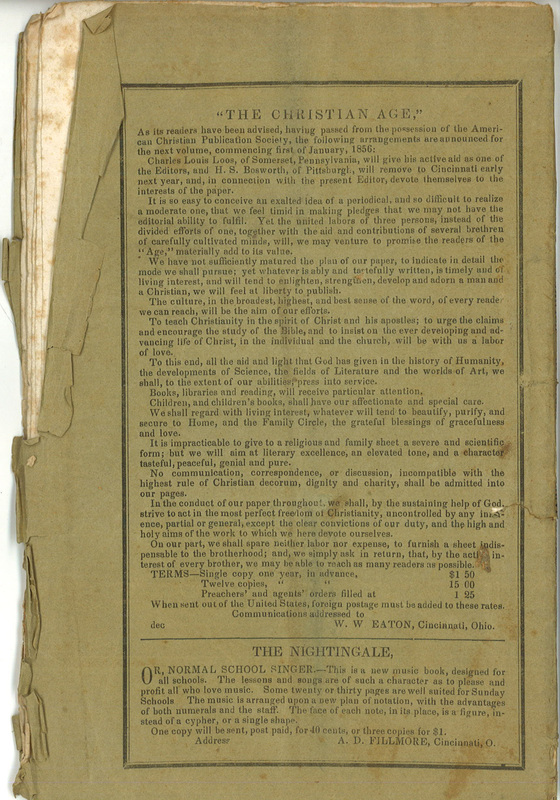 Regrettably the covers were almost always stripped off in this process, thereby losing information such as news items, advertisements, or lists of agents who handled subscriptions for the paper. How significant it will be to interpret these issues in a museum exhibit or in a class of students. They forcefully convey the ‘realness’ of the past and the positions Shannon advocated. 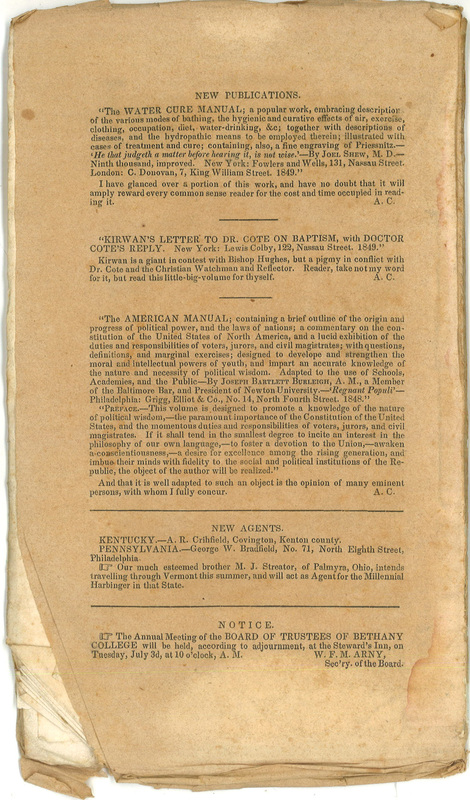 The January 1856 issues carries an article describing a disturbance at Bethany College among the student body over slavery. 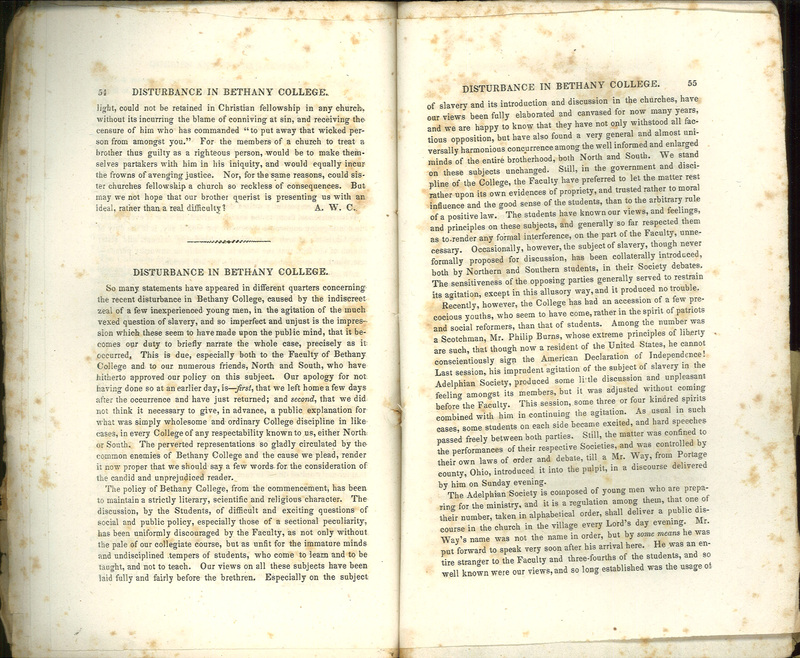 The January 1856 issue also bears a pencilled notation concerning the ordination of J. W. McGarvey. 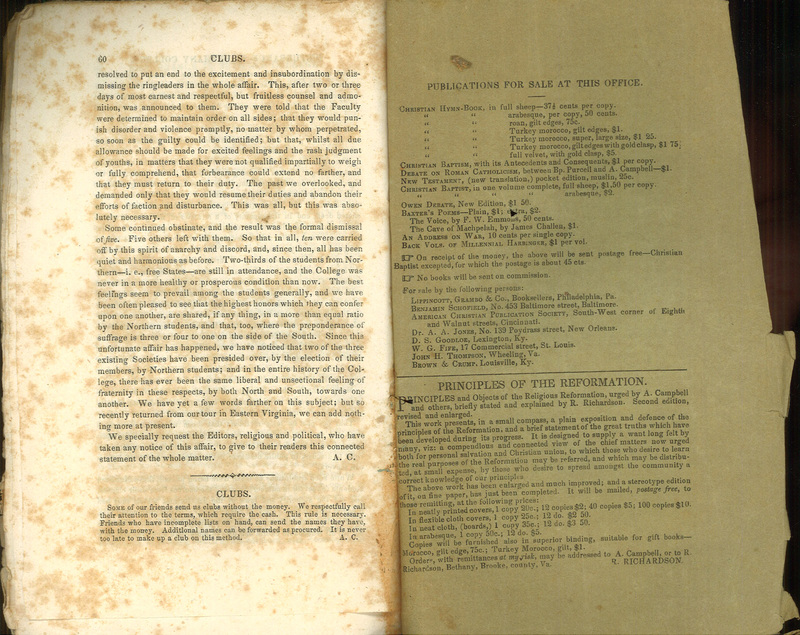 There is also a faint pencil notation on the front cover (see above) calling attention to an article in the issue by C. L. Loos. Presumably these notations are in Shannon’s hand. 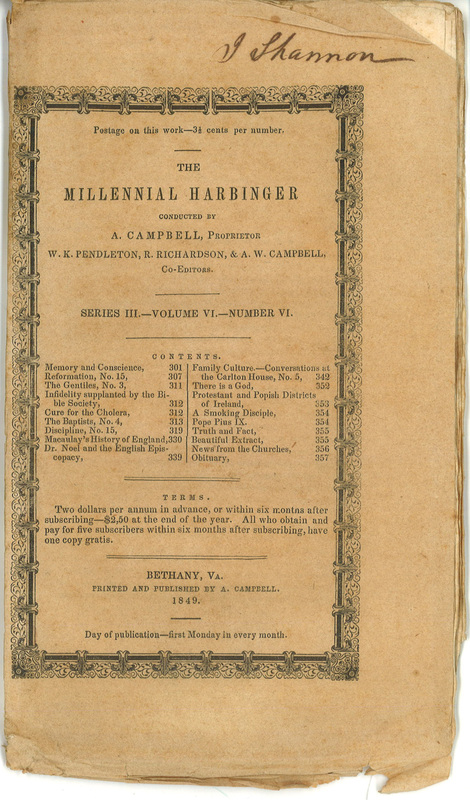 Title page, Millennial Harbinger, January 1856, owned by James Shannon. Notations very likely in Shannon’s hand. Our normal course of accessioning calls for single issues of periodicals to be foldered, boxed, and catalogued with other issues of the same journal. In this case I will accession them as a manuscript collection in Shannon’s name. 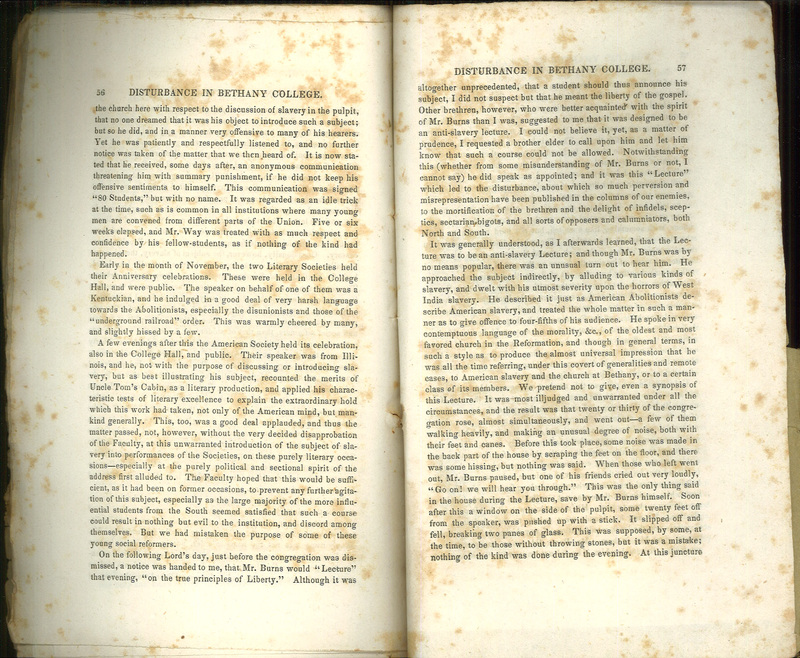 What sets these issues apart is Shannon’s ownership and having them in a discrete manuscripts collection will ensure their preservation and visibility to our students and faculty, to the scholarly community, and to the church. *John Carter, ABC for Book Collectors. New York: Knopf, 1991, 25. 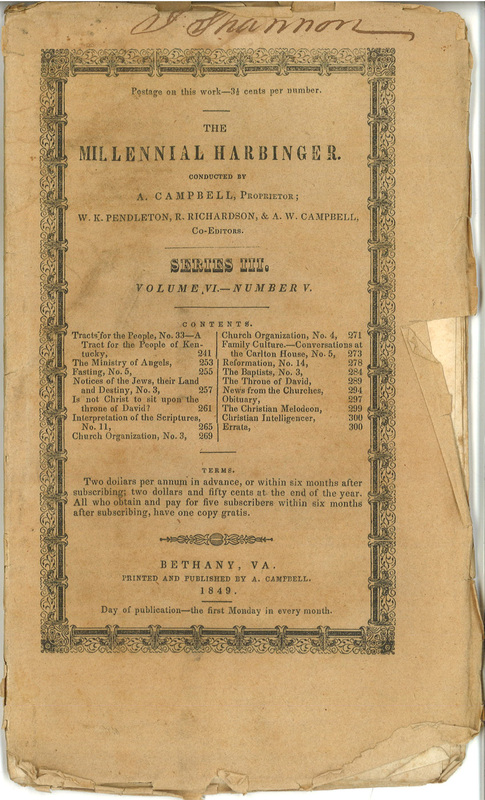 **David Edwin Harrell, Jr. Quest for A Christian America: The Disciples of Christ and American Society to 1866. Nashville: DIsciples of Christ Historical Society, 1966, 122. This entry was posted in News, This Just In by Mac Ice. Bookmark the permalink.